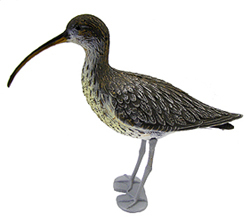 This Curlew decoy is another great decoy to give confidence that all is well on the shoreline, as these birds are very weary and fly at any sign of danger. Again this decoy will look great in the lawn, garden or even in the house. This bird measures 14 3/4" tall and 19" from tail to beak. A stake is included. This small shoreline bird is a great confidence builder for all waterfowl. As it is a very nervous bird, and will fly at the slightest hint of danger. Measuring 10" from tail to beak and 5.5" tall. 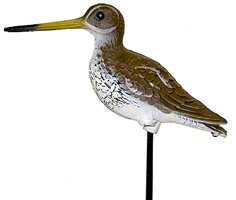 The Snipe decoy is for those few die hard hunters who still hunt this bird whether in the field or at night on the right of passage Snip hunt. 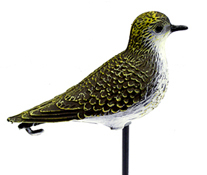 Again this decoy will look great in the lawn, garden or even in the house. This bird measures 4" tall and 9 1/2" from tail to beak. A stake is NOT included.